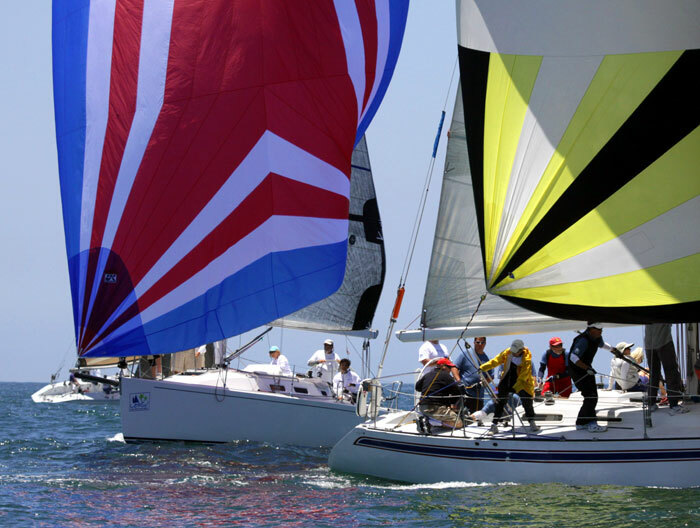 LONG BEACH — Although Ullman Sails Long Beach Race Week, co-hosted by Alamitos Bay Yacht Club and Long Beach Yacht Club June 28-30, is long established as the West Coast’s largest keelboat regatta, that doesn’t mean it’s just for big boats. Smaller classes with keels — notably Viper 640s and J/70s — are coming on strong. The 21-foot Vipers, led by defending champion Jim Sears, an Alamitos Bay YC member and co-host of the CBS television show “The Doctors,” top this year’s entries — with 23, so far. The J/70s, at 22.75 feet overall, are making their debut at Long Beach — but they have swamped East Coast docks with 55, 49 and 39 boats at Charleston, Annapolis and Key West (respectively) over the past year. That suggests that J/Boats, which had 26 percent of the total 133 boats in 15 classes at Long Beach last year, should boost their numbers with the usual fleets of J/80s, J/105s, J/109s and J/120s also checking in. One attraction the Vipers and J/70s share is their portability. They can be kept at home and towed anywhere — which is why the current entry list shows homeports from three states and Vancouver, British Columbia. There’s even Glyn Locke’s Viper entry from Great Britain’s Isle of Wight. Bennet Greenwald, from San Diego YC, is a J/70 favorite who joined the new class on a whim. Earlier this year, he planned to sail his larger J/105 at Quantum Key West Race Week in Florida, but the class failed to establish. Rather than miss the action, he chartered a J/70. With pro Eric Doyle as tactician, Greenwald said, “We had a blast … a lot of boats and great competition, and we did OK” –12th among 39 boats. Greenwald has been sailing “since I was 13 … more than 60 years; let’s put it that way,” he said. In March, he won the San Diego NOOD Regatta, among 10 boats. That would be Vince Brun, the 1986 Star class world champion. Racing will be on three courses set inside and outside the port’s federal breakwater. Each day’s competition will be followed by onshore parties hosted by the yacht clubs, with free shuttle boat service across Alamitos Bay between the two clubs. Competitors will be racing for a truckload of trophies — for, among other goals, the Farr 40 West Coast championship, the Open 5.70 North American championship, the Catalina 37 and Olson 30 National championships, the Viper 640 Pan-American championship qualifier and points toward the J/80, J/105, J/109 and J/120 Southern California High Point Series. All 10 of the Catalina 37s chartered from Long Beach Sailing Foundation have been taken by teams from as far away as Tacoma, Wash. and Scottsdale, Ariz.
Free mooring assignments are available for out-of-town boats. Onshore accommodations, including those at event sponsor Ayres Hotel in adjacent Seal Beach, may be booked with special Race Week rates. For more information, visit lbrw.org.